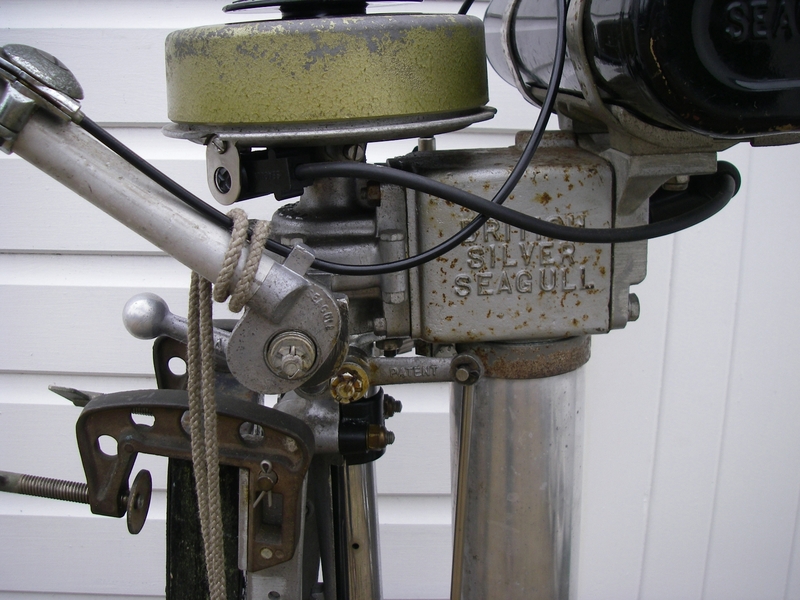 My British Seagull motors reconditioned for sale and sold. 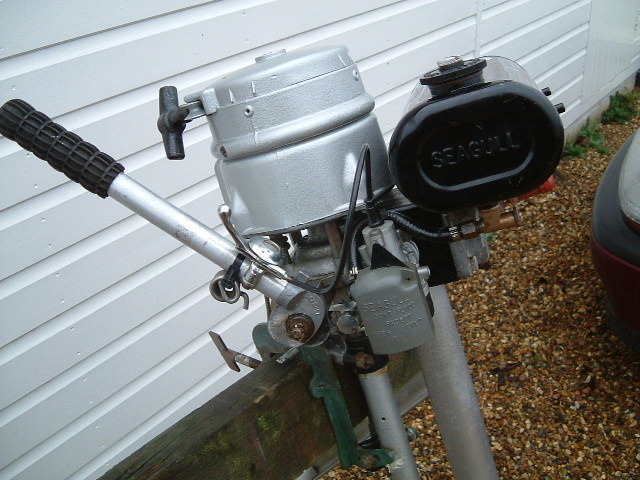 Engines For Sale and SOLD! These engines will be at my address in Tillingham, Essex. 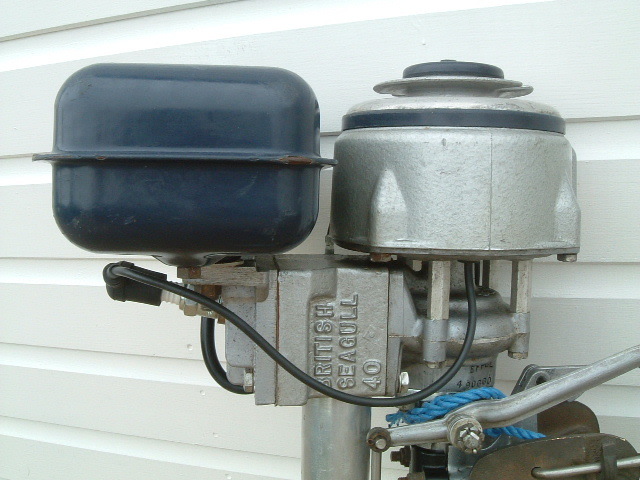 I will place any reconditioned or stock clearance motors on this page when they become available. Beware, Beware, Beware, E-Bay Bargains!! 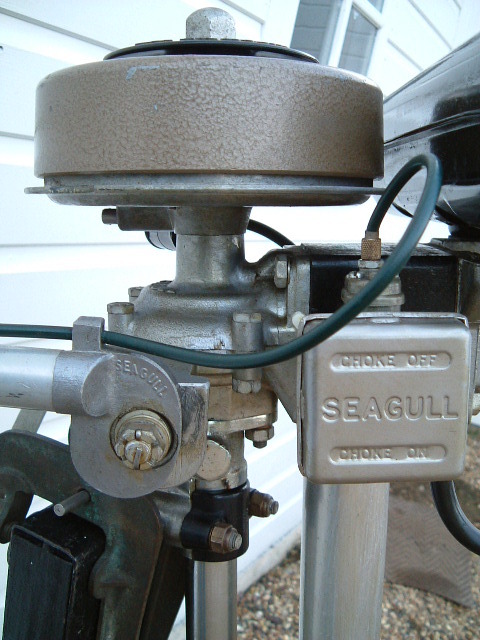 There are some really unscrupulous individuals out there that are selling British Seagull parts on E-Bay, some are selling at inflated prices and often not new! A used Drive spring for £5.00!!! What!! New, at the time they were only £3.50...... and my P&P £3.50! 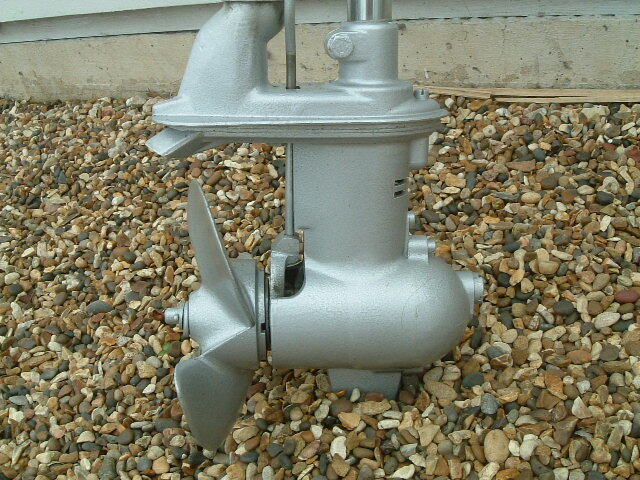 In 2007, a new spring was seen, 'buy it now' price of £10.00! I have also seen postage prices of over £5.00!! For 1 spring! ! 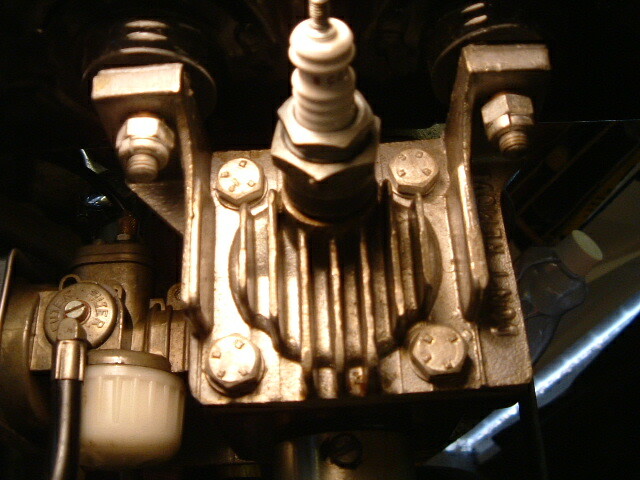 (my post is at cost,£3.50) Gearbox plugs selling at the 'bargain price' of £5.00, new, they were just £2.60 at the time!! 40 Head gaskets, £12.99 + £3.00 (nearly twice my prices of £7.75+ £1.50 then). Today, 2017, drive springs have gone up to £4.25 and gearbox plugs sadly higher,£4.75. Century head gaskets £12.00. But the EBay sharks have increased their prices way over that. You have been warned! 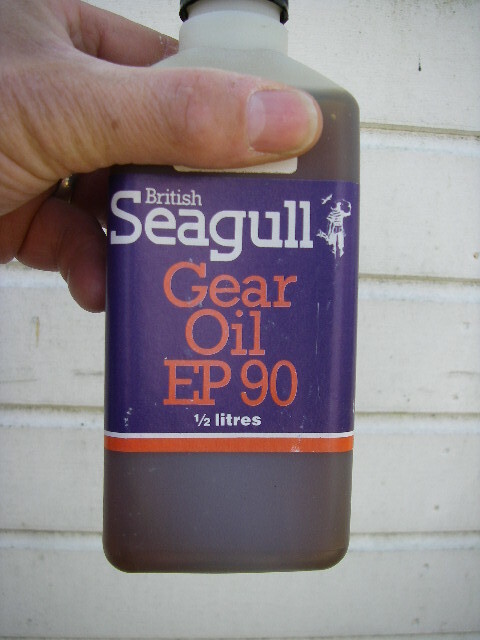 Above is a picture of a genuine British Seagull bottle from my museum, yes it does read EP 90.. Sadly he cannot even spell Villiers, some British Seagull enthusiast and if anyone actually wants an old Villiers flywheel I have dozens, sadly had to scrap hundreds, there is a limit to what I can store ...., you can have one for free! Not for his extortionate £14.99!!! plus post! You have been warned, ring me for a price first! Compare prices I promise not to fleece you. Bet I'm always cheaper and the springs will be new, as are most of my parts. 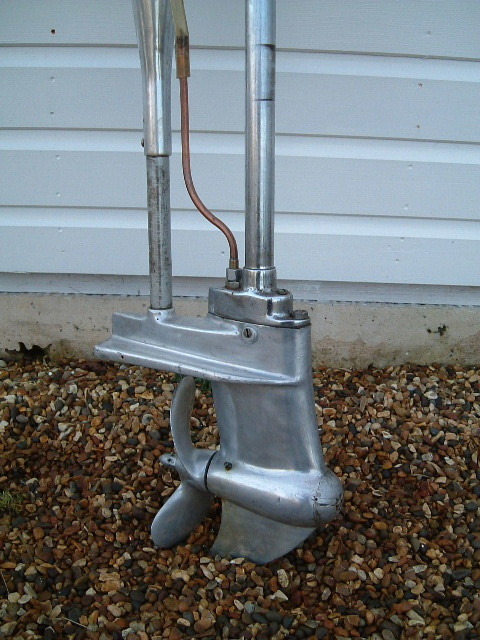 Where I cannot any longer get new spares, I often have used available, castings etc. Used parts will be considerably cheaper of course, than the price of a new part, when they were last available! I do feel sorry for those who get stung this way...there seems to be more and more unscrupulous people out there. E- Bay simply say 'buyer beware ' ...You have been warned. Why get fleeced!??? 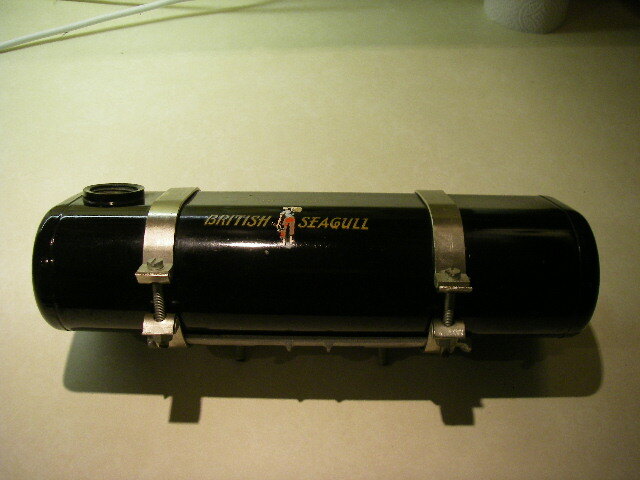 Seagull 160 inboard on stand. SOLD November! Rare to find intact these days, only the second I have ever come across, in over 25 years. 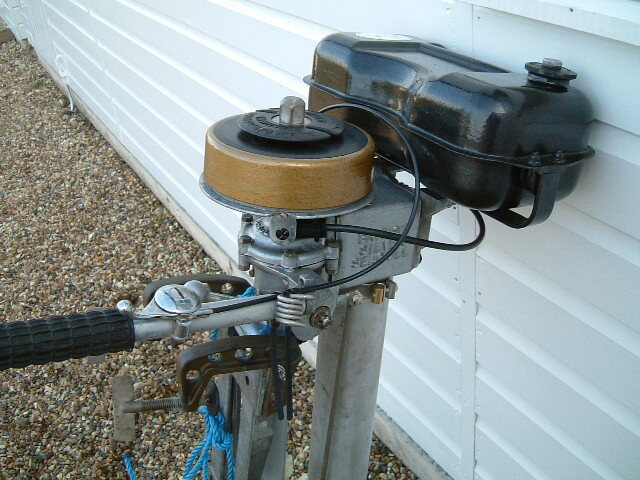 This is as near complete as you will probably get, with FNR gearbox and the bracket to attach Morse controls. 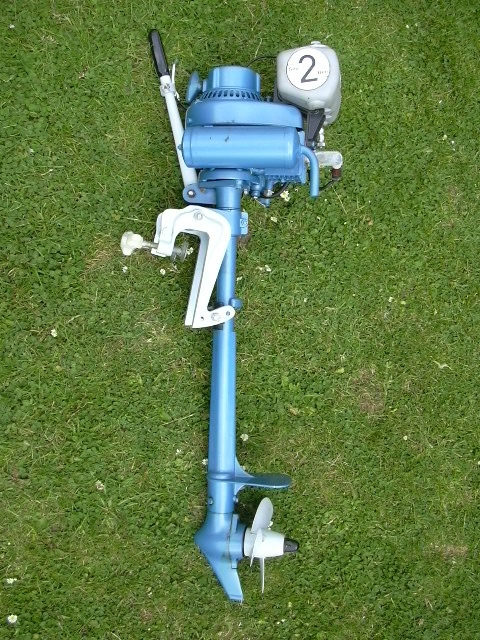 Standard with recoil and alternator. 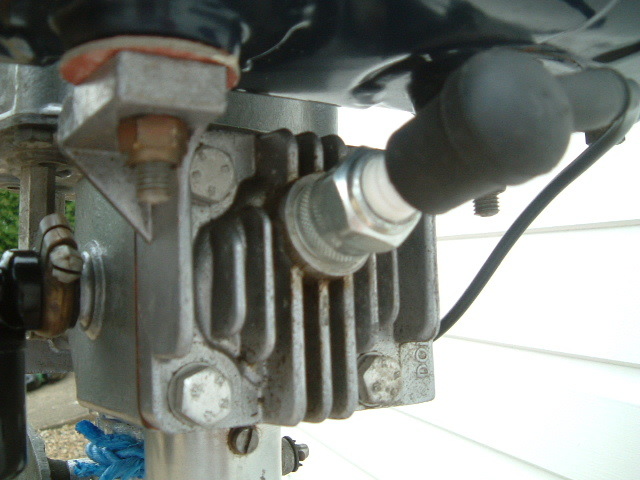 The later special air intake cover and the full stainless steel exhaust with mixer. Mounted on a stand would make a good, rare exhibition piece. 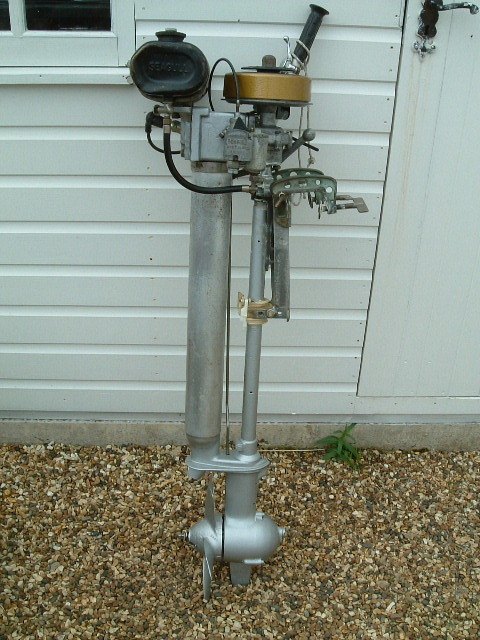 OK this had the same basic flaw as the outboard version, the 170, it had a suspect big end cap. Modify that and it could be a runner. 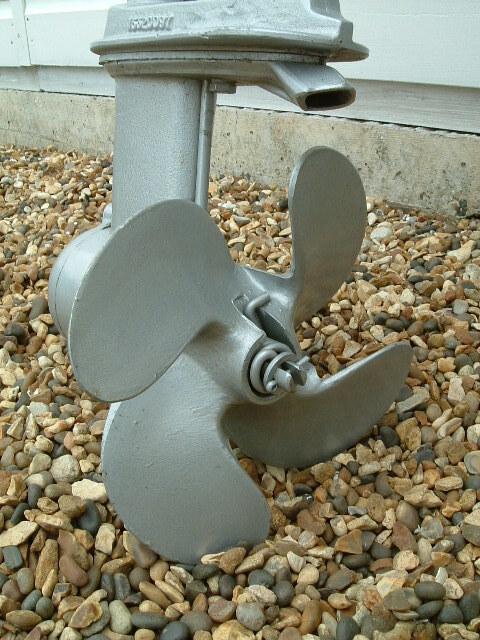 Best either as a display model or for use in freshwater to avoid the salt corrosion. Buyer Collects from Tillingham, too risky to courier. 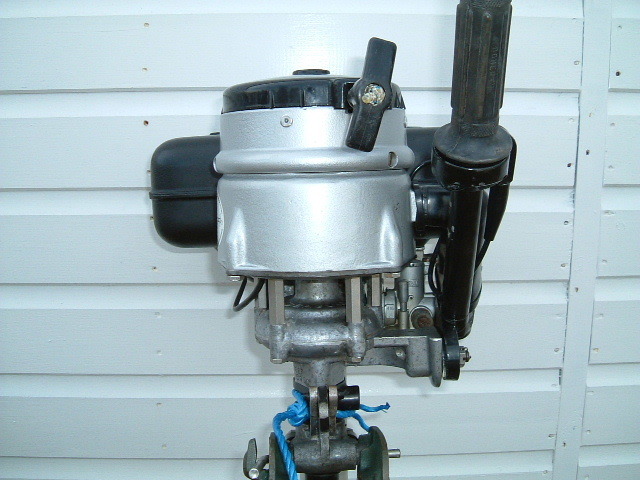 New Kingfisher 6hp outboard, over 95% of the parts new, ready to assemble and use. 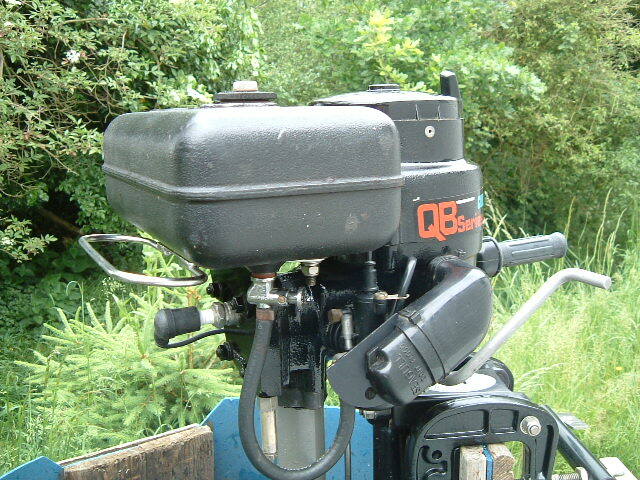 This motor is one I had been collecting the parts for over a number of years, meaning to use it myself on 'Seagull' the 16ft open boat. Since I parted company with her, (with regret!) 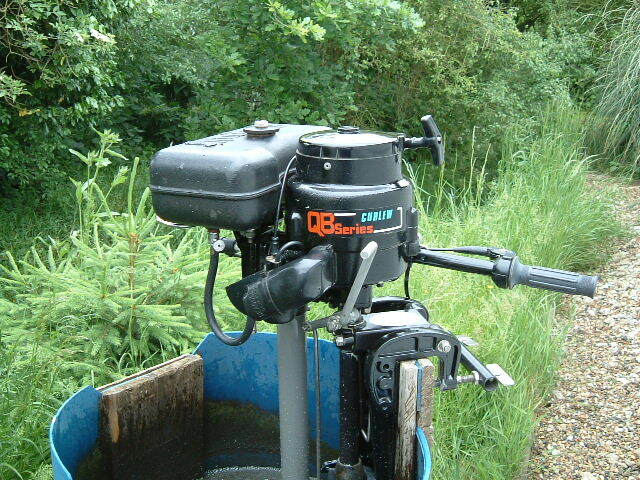 it realise this motor probably will no longer be of use to me. 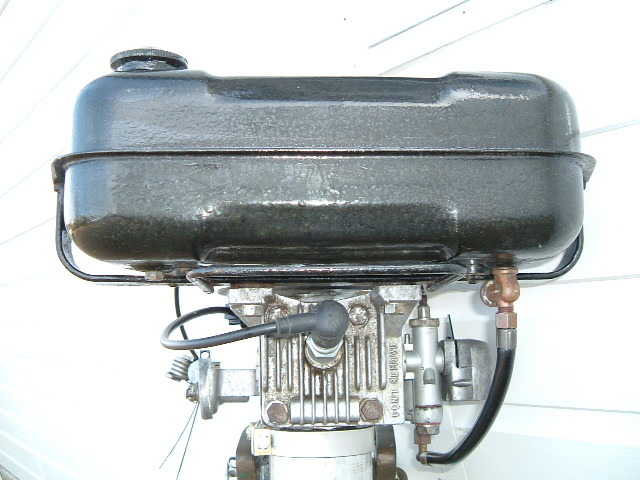 It has a new cylinder and crank case, new internals, including a new inner exhaust and outer! 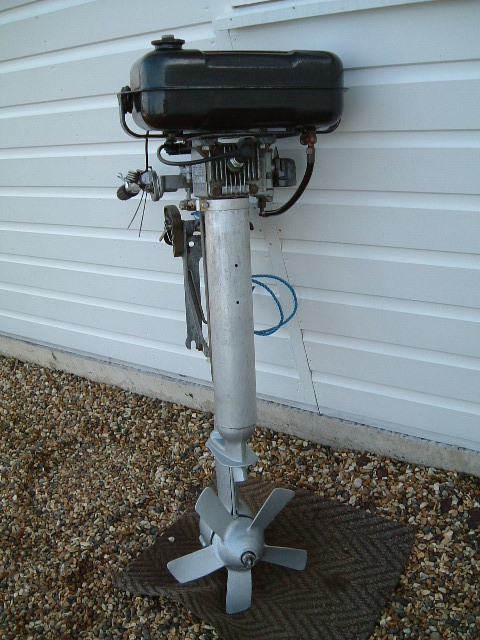 new gearbox and prop etc. Very little is not new. New casing tube the lot. This could be couriered in several boxes at cost.. but better collected in person from Tillingham, Essex. November 3rd... SOLD!!!! Did not think it would be here long, 10 days! She has wooden mast and spars and a new set of sails, tan spritsail rigged main and tan balanced lug mizzen, tan jib on bowsprit with Wykeham Martin Gear. 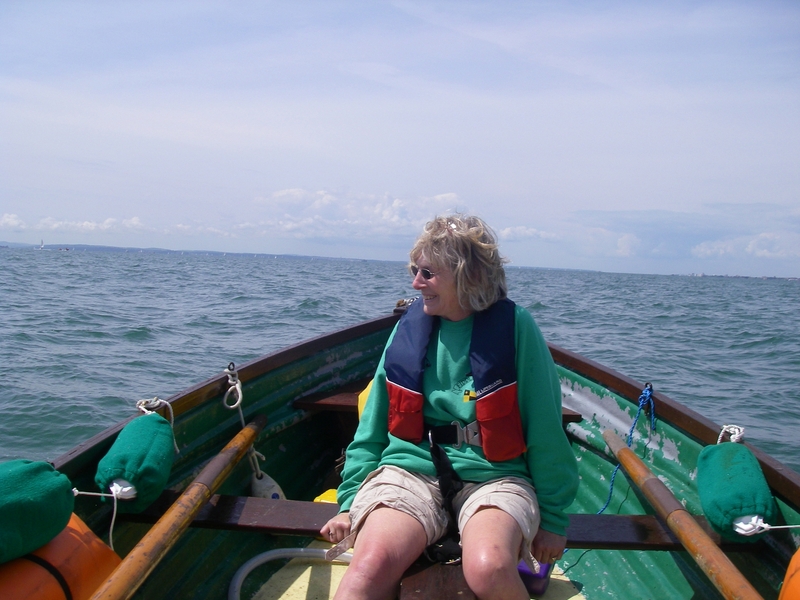 Has a short bowsprit and a bumpkin! 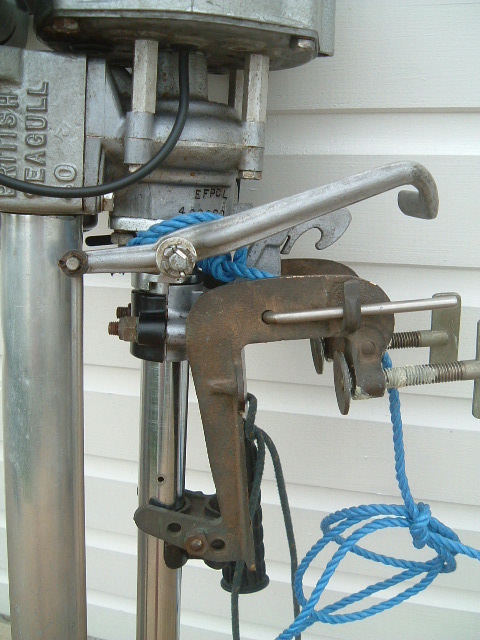 Mizzen slots into fitted hoops and main mast fits in gate, easily lowered and raised. 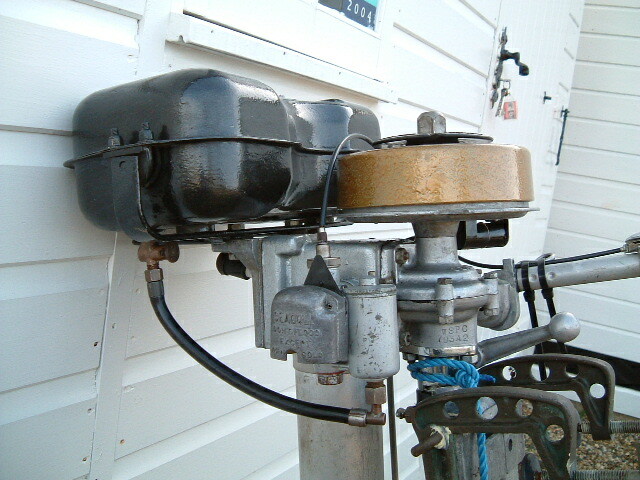 Mast stores securely on boat for towing and supporting the fitted cover. Tows behind family car. 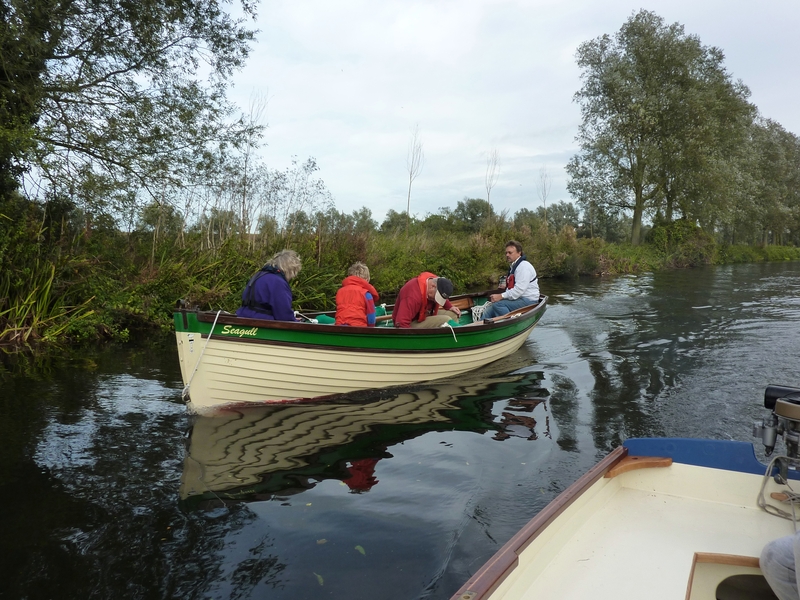 She comes complete with a pair of 12ft long sweeps, anchor and rope, (that stows neatly under the sole), a bailer and sponge and fitted new Whale bilge pump. Set of 4 good fenders, all in green socks, bronze, self stowing captive rowlocks. Fitted with transom drain in bronze for draining whilst in storage.. Coir bow fender. Pair of life jackets supplied. There is a steel centreplate, yet to be fitted and a transom hung rudder to fit. Pin for pivoting the centreplate fitted in hull, blade slots in and is secured when top of box fitted. Box full of bronze cleats, dead eyes etc. to complete the sailing gear. She has never been rigged. 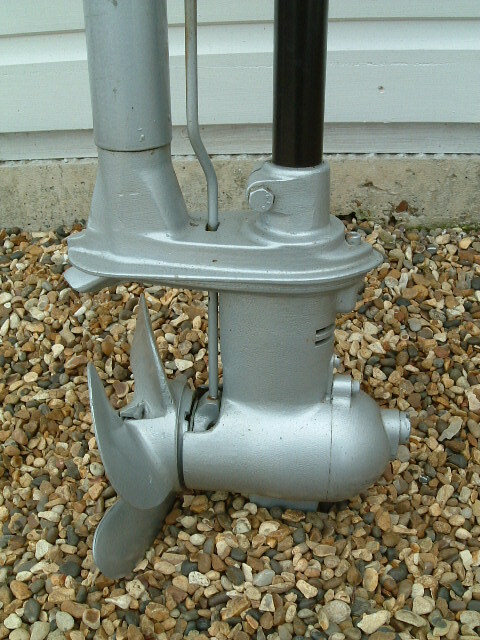 Outboard bracket offset on transom for long shaft British Seagull outboard. A real sea boat. Really looks the part. Slips through the water easily, with just a few pulls on those sweeps she is gliding effortlessly... This design is the result of eons of development culminating in a perfect shaped boat for sailing or rowing and very suitable for a Seagull. 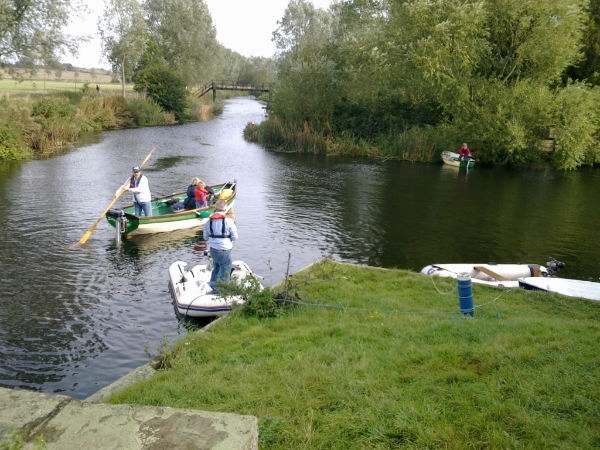 Remarkably stable hull and a safe boat in a chop! Moulded from the last 1880's Thames Waterman's Wherry to operate on the London river. (Now in the Science museum.). Built in GRP in the early 1960's and used as one of 6 such boats, to train the lads of the King Edward the VII Nautical school at Deptford. 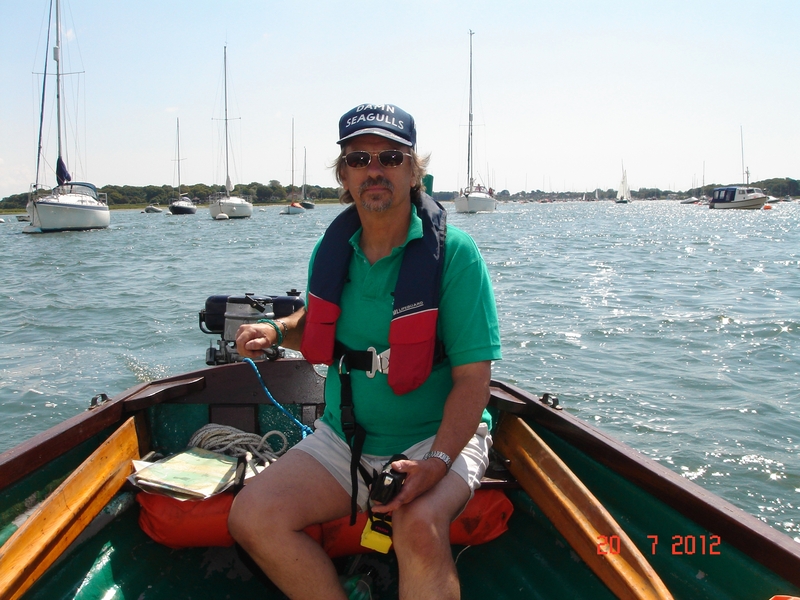 Retired in about 1985 and purchased by me and converted back to it's original rig with centreboard and plate, mast and sails etc. She is on a galvanised, braked, West Mersea Trailers, break back, easy launching trailer, with sprung loaded rear rollers to assist recovery. Wheels do not get wet! One man operation. 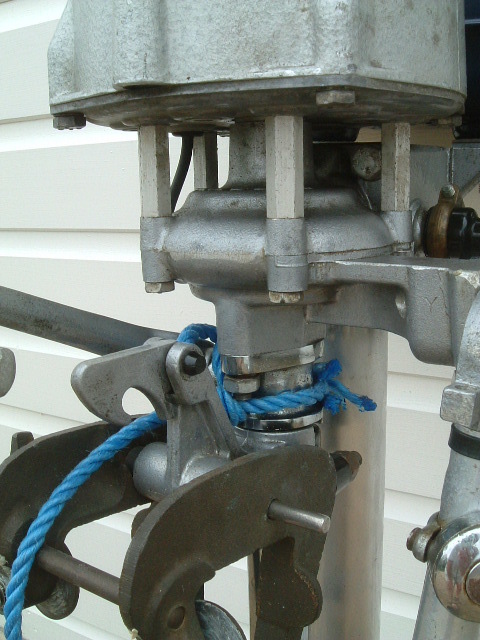 Winch with webbing strap for recovery... spare wheel. 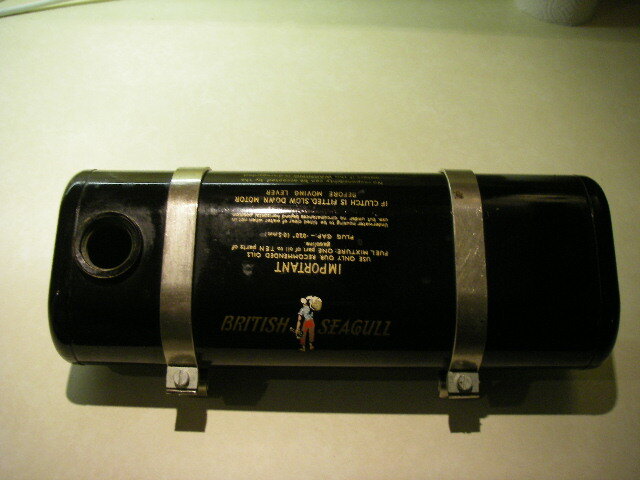 Fitted cover for storage and trailing. Made by Lonton and Gray, 2015. 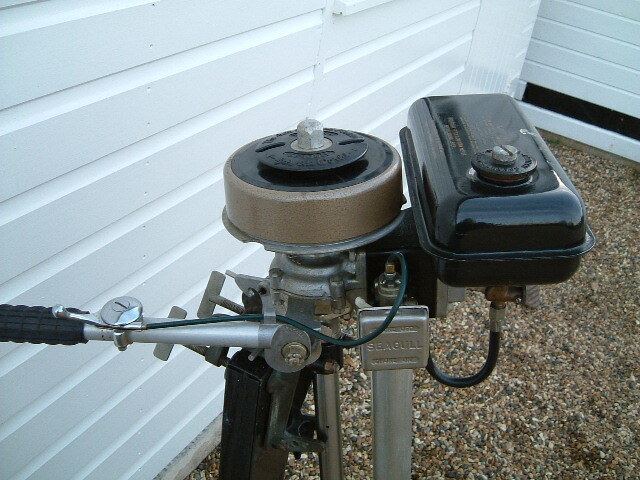 At present in Tillingham, Essex, on very roadworthy trailer in our garden..
£2250 or very near offer. Boat under offer at the moment December 2016. Sold January 2017 and gone to a good home! 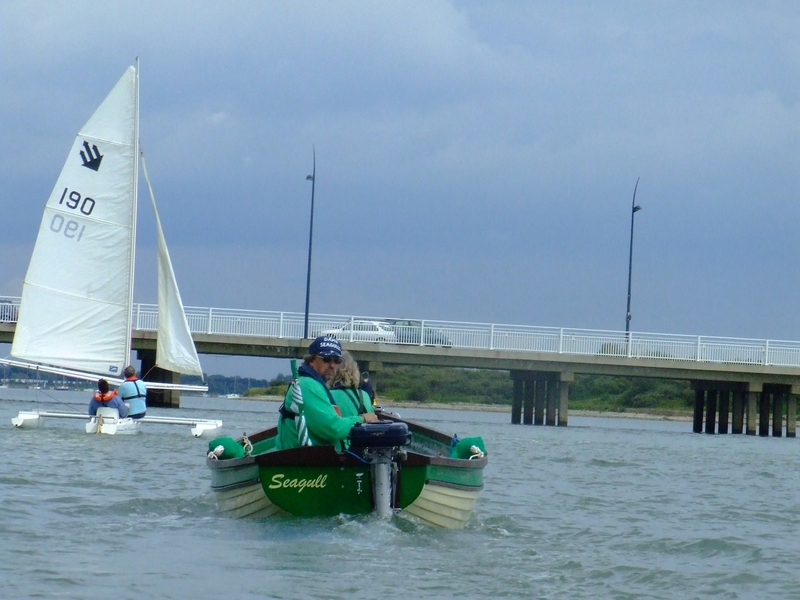 GRP, fully Optimist class ready and club tested with all kit to just drop in the water and sail to class specs. 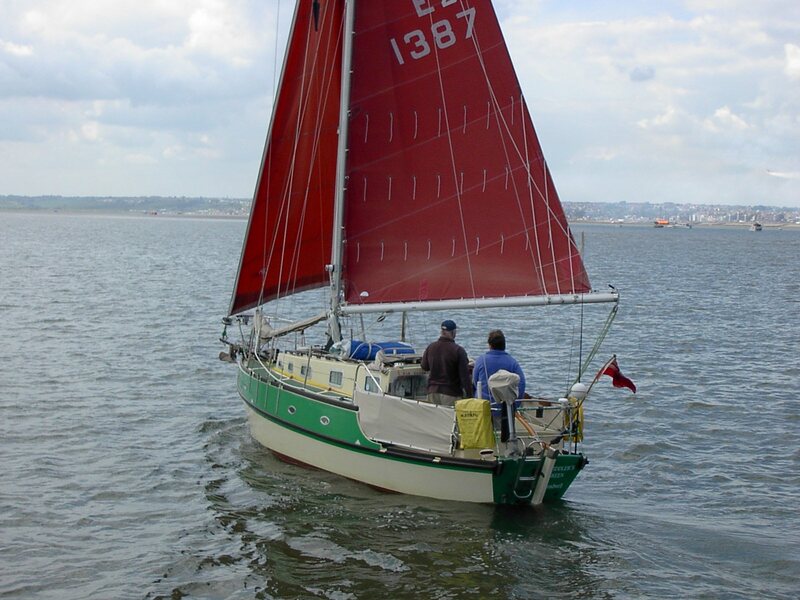 Has bow fender/bumper, full cover, sail and spar bag, centreboard and rudder bag, with safe stowage for burgee and spare lines... Mast clip bailers on bungee as per specs, paddle the lot! Even has a purpose made, new, take down Optimist launching trolley. Will stow in the car boot if boat carried on roof rack! This was used for a year or so by my grandsons, but the older out grew it at a large 14 years old and the younger took up Karate! (The older at 16, is now my occasional crew and a good one!). Stored securely in a dry locked garage for the past 2 years, but it is now time to let it go to a new generation of new sailors. The perfect present for an aspiring 8 year old! 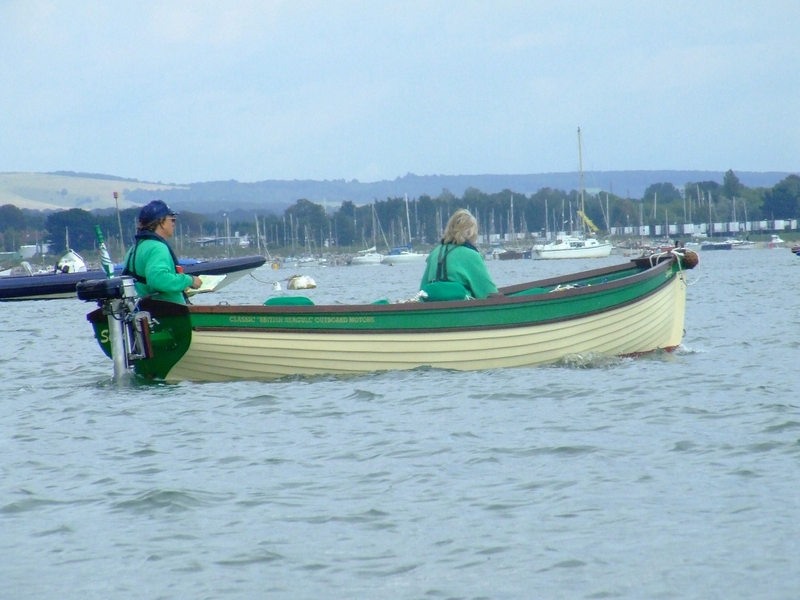 Join a club and present this and he will be out sailing instantly. 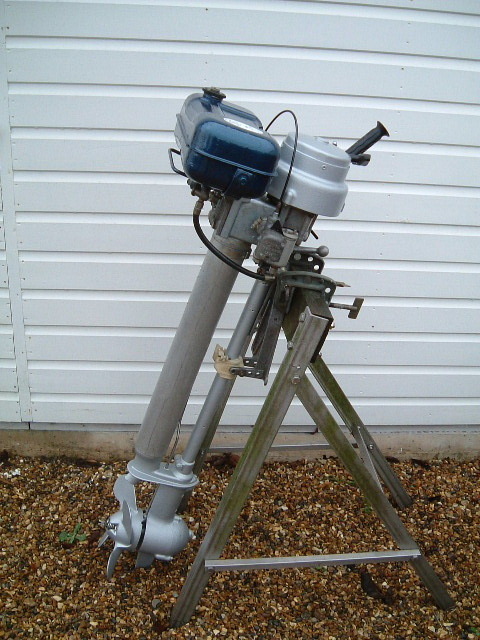 SOLD: 1976 GFP, as new, unused. Stored from new and checked over by me. This has a virtually unmarked fuel tank, perfect chrome and was just dusty. 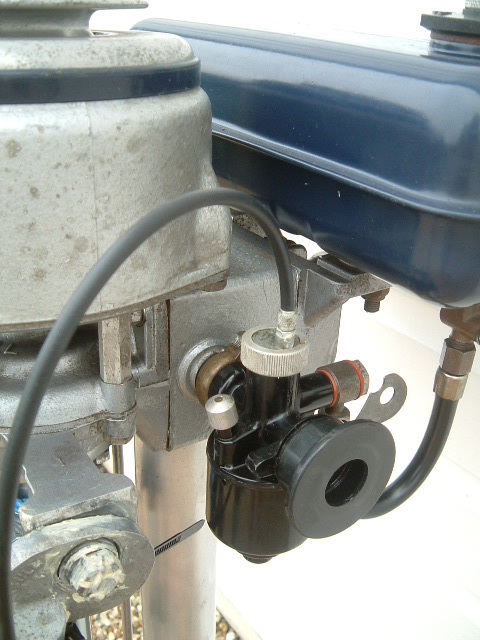 Fitted with new HT lead and plug. 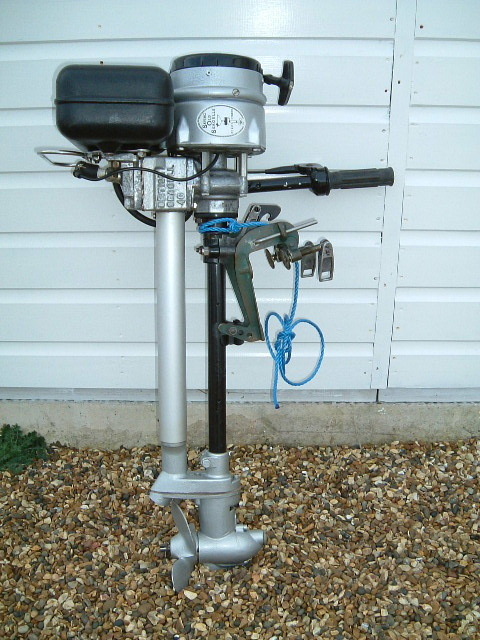 Sold for £375.00 collected from Essex. SOLD!!! : Wartime (WWII) SD. What I would call the 'Navy type'. The flywheel is of the original type and has a copper cover. 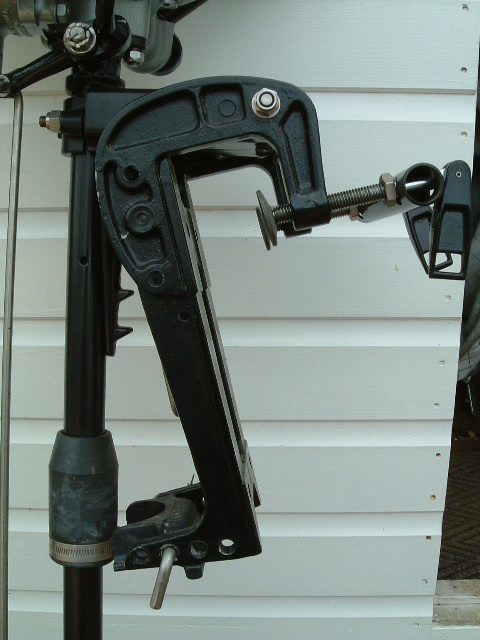 The gear lever is bronze and it has the bronze skeletal bracket I associate with these models. Bronze exhaust. 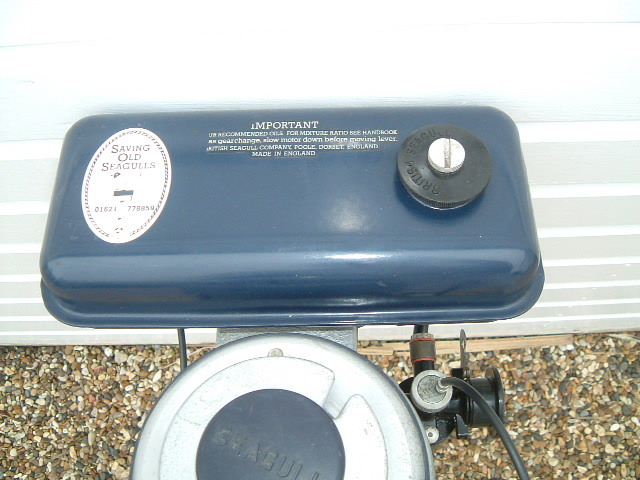 Steel tank with bayonet fit copper fuel cap, original tank straps. 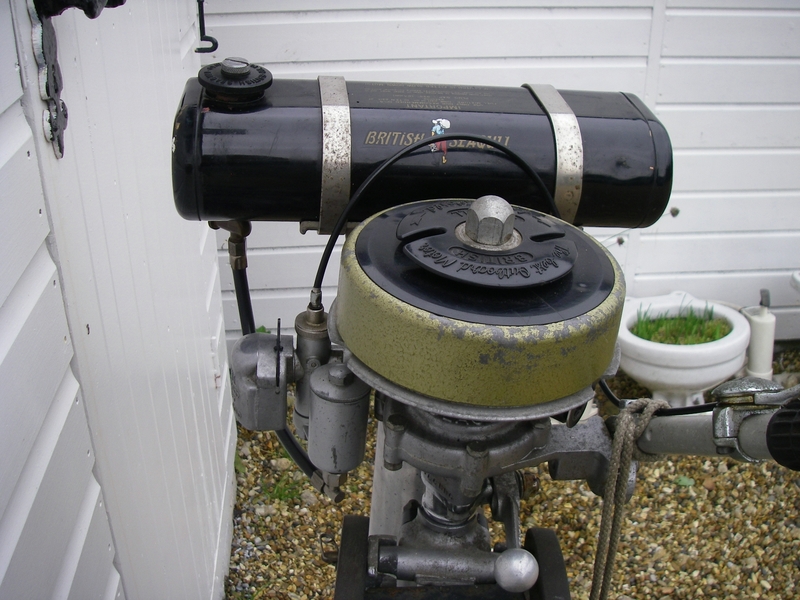 This motor has come to me from a friend, it was his fathers motor , and he had it since the 1950's. It is not seized, but beyond that internal condition is unknown. Has good compression though. 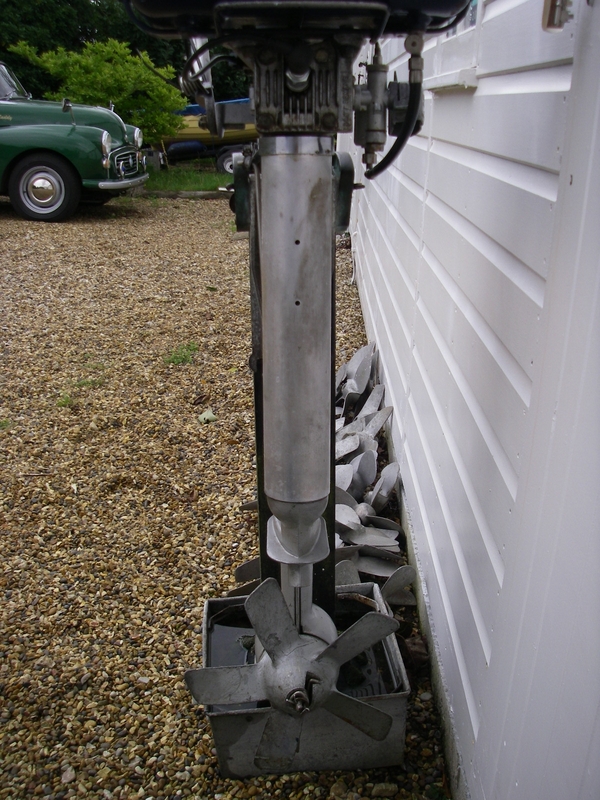 Have not tinkered and have no idea if the coil is still good, but after 70 years or more suspect it is not, but this motor is not for general use, it is a Second World War Museum piece and should be treated as such. It has been stored in a garage for 40 odd years and looks as if someone opened a tin of distemper too close, so has a few splatters of paint on it.! 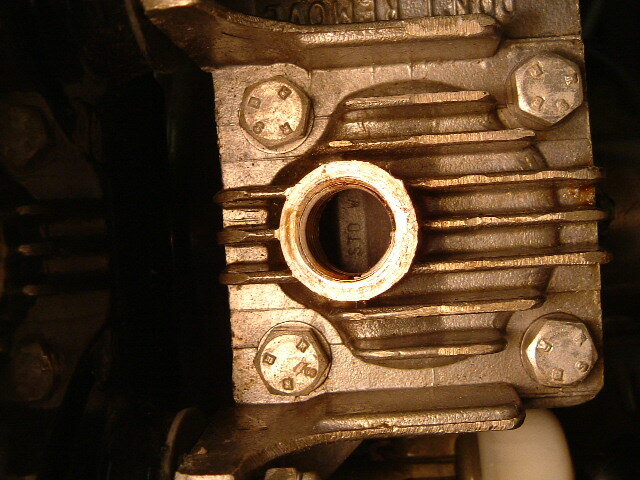 the pinch bolt has been replaced with a nut and bolt, but suspect a collector could restore the thread with a helicoil and refit the correct bolt. 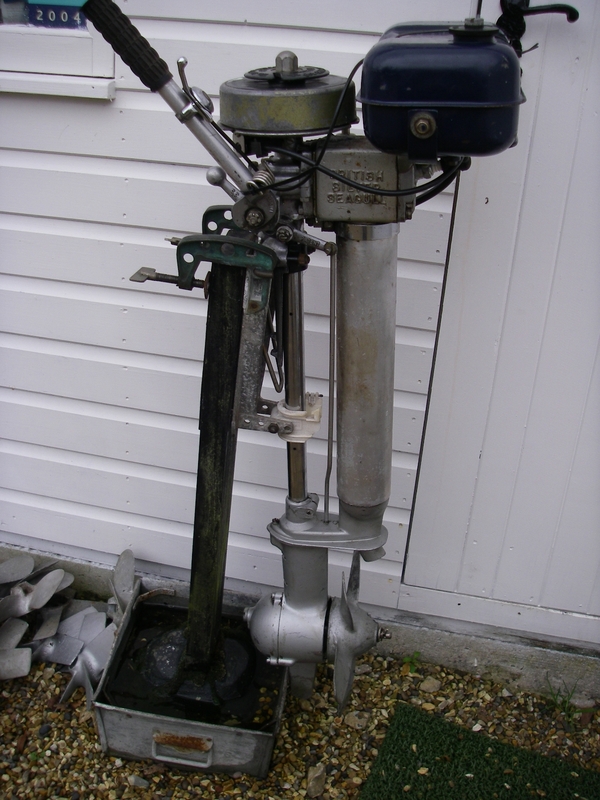 Was offered at £250 to an enthusiast or collector to polish up and preserve. Normal price for one polished can be over £400. They do not come up that often, certainly not as complete as this one. 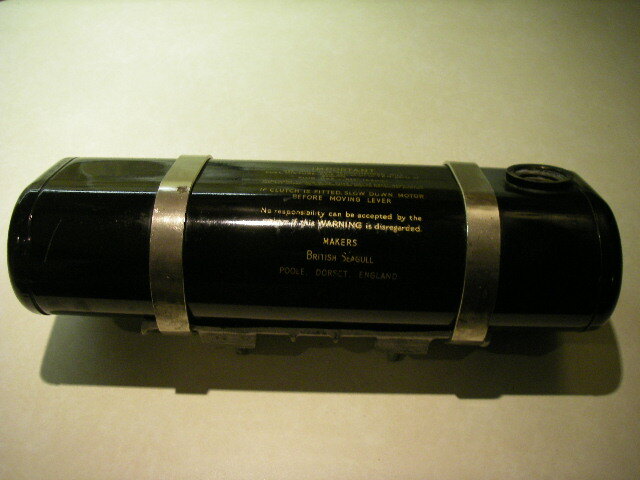 WSPC Standard shaft. Very nice condition. I have replaced HT lead and plug, sold with spare spring. 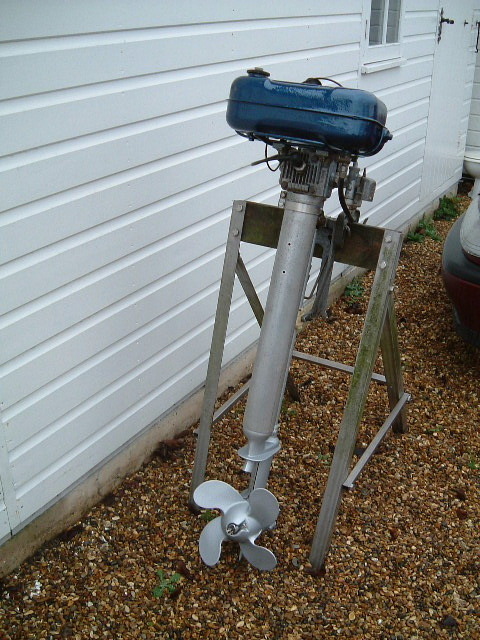 all up and working nicely but not titivated, needs polishing and maybe a little paint on the flywheel etc. To be picked up from Tillingham. Sold 2011. 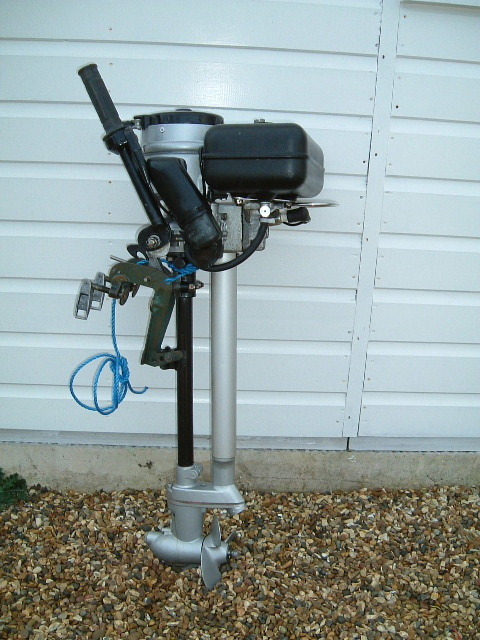 SeaBee 2 outboard Sold , not one of mine but one of my suppliers 'Villiers Parts'. As the name suggests it is a 1.5 to 2h designed for the smallest dinghies. It is also new and runs well of course. Very late Wipac magneto WSPC, chrome almost unmarked. this motor has been stored all it's life and possibly only started to test. 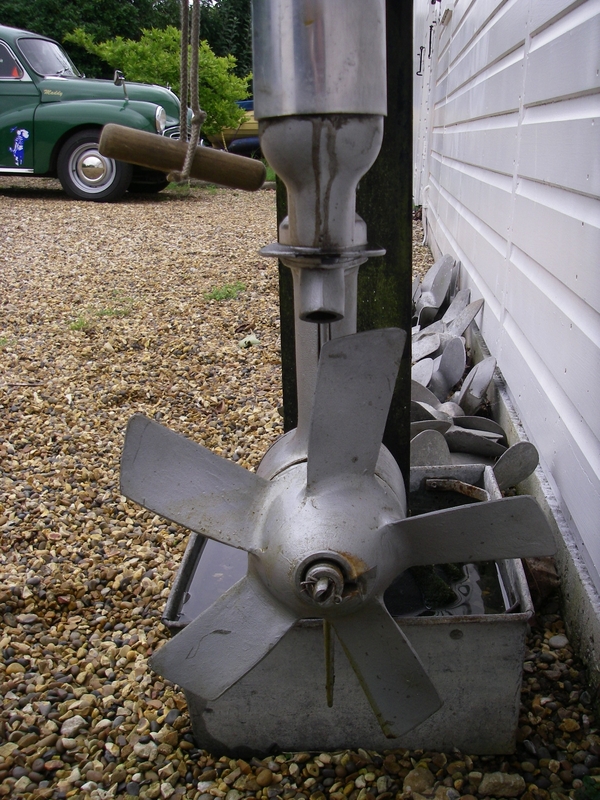 We have tested it, its like new, the flywheel lets it down, as with all Seagulls the paint did not stick too well! I have not even tried to clean the dust of ages off this one. Long range tank almost unmarked! Chrome straps may polish up, or you could fit a pair of my s/s ones! 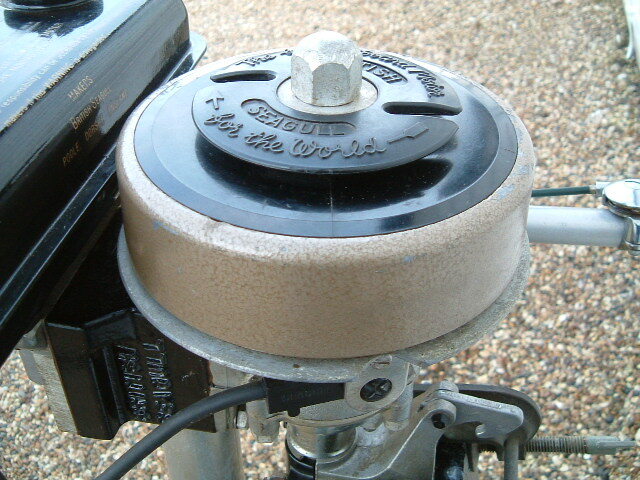 Still has original HT lead and cap! Would recommend changing those if you are going to use it! 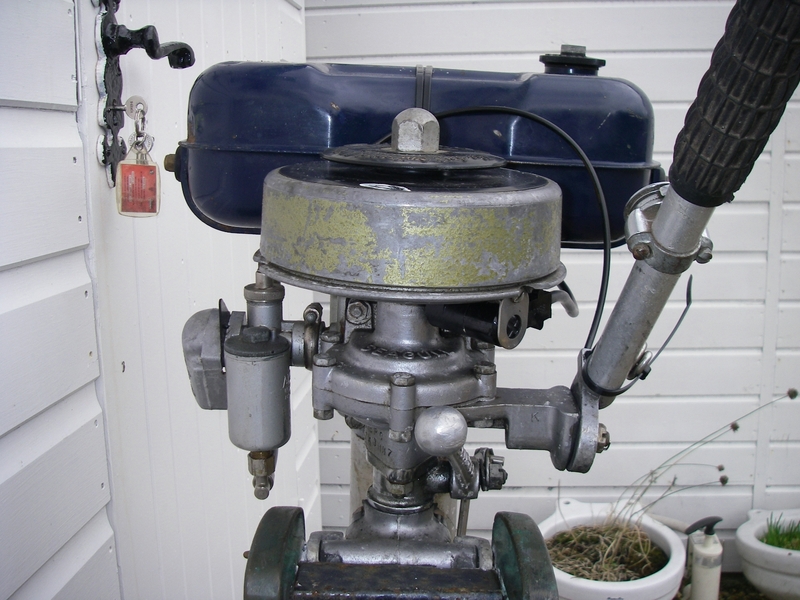 This motor looks unused, a max of 5 or 6 hours I would guess, maybe just testing! It has no corrosion as you can see so I bet it has only been started in a tank! It was purchased from a gentleman's family. Found in his garage after his demise. 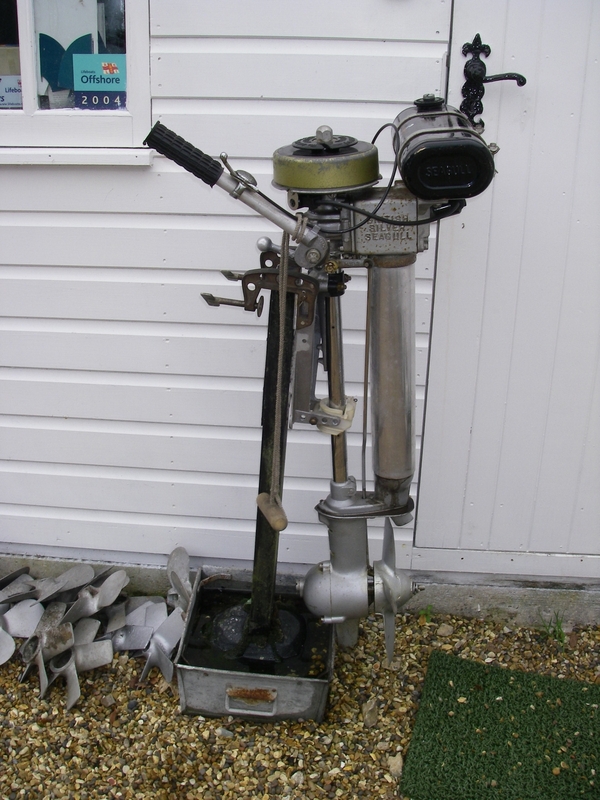 He apparently bought it and stored it, along with 25 other outboards of all sizes and makes, motorbikes and lawnmowers..... 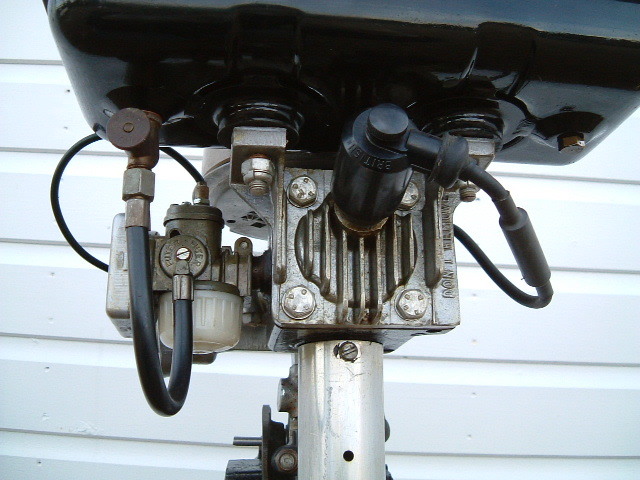 The only damage I found was to the throttle cable, done in storage, it has been replaced of course. 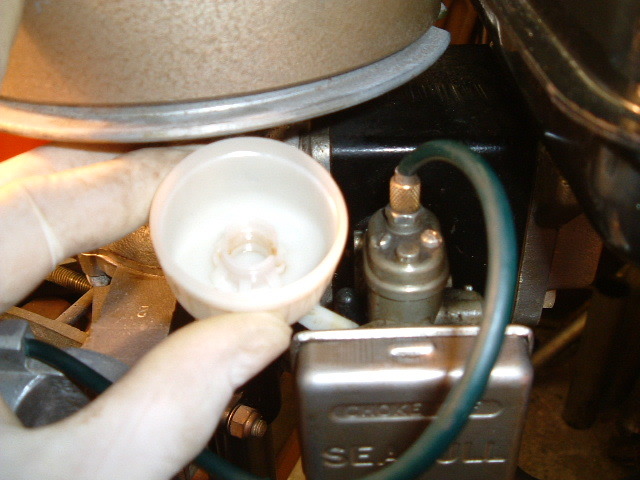 Sealed CD ignition and runs on 25:1 mix. 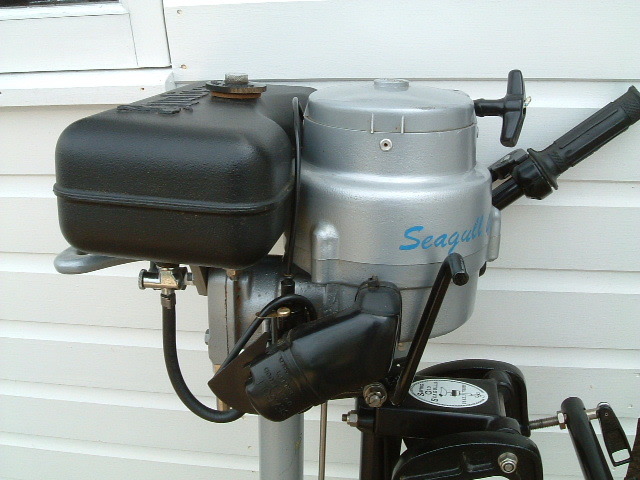 can be fitted with the British Seagull recoil starter, which I have in stock.. Will suit dinghy with high freeboard, up to about 14 or 15 ft, or as standby on small powerboat. SOLD! Curlew 4 hp. Long shaft. Built from new parts. Unused. 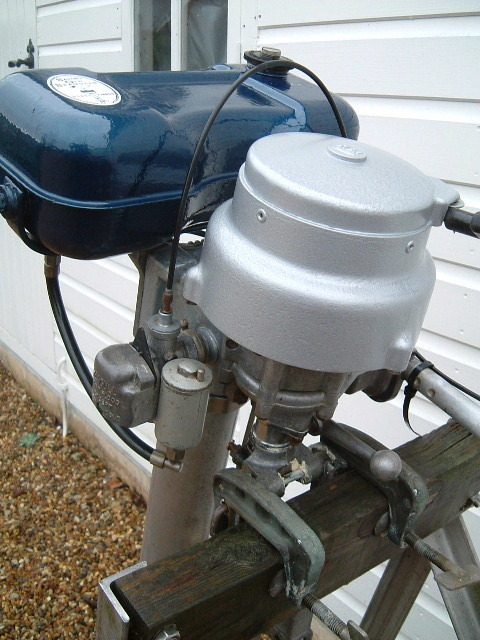 This motor was loving built by me from new parts obtained when I cleared the British Seagull factory in 1996.Though the crankcase has a 1990 date on it, most of the motors parts are unused, including the block, head, bracket, gearbox, prop, inner and outer exhaust, carb, drive leg, etc etc.. It has only ever been used in the test tank. Click here for a Video clip of it running! I built it to go onto the back of my daughters wedding present, an 18ft Foxcub cruiser. 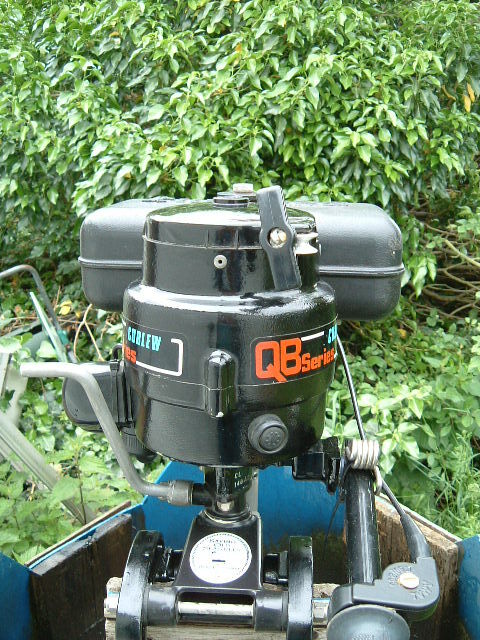 Despite loving my motors she expressed a need for a reverse gear, for the new mooring in Brixham marina they were offered. 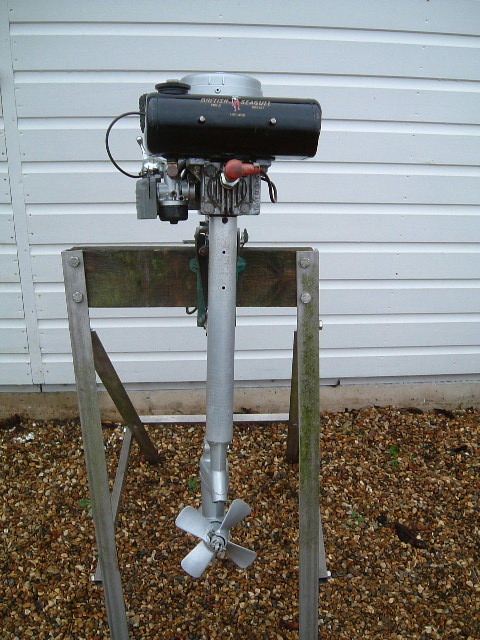 Thus this Easter, before we launched, I swapped it for a 'different' sort of 4 hp...a Mercury! Wash your mouth out John! (Actually it is a very nice sail power job and does nearly as well as I think the British Seagull would have done!). 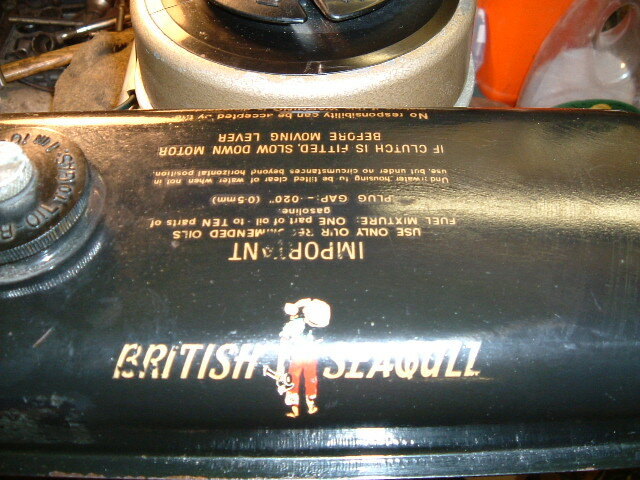 So I have a quite rare British Seagull to offer for sale. 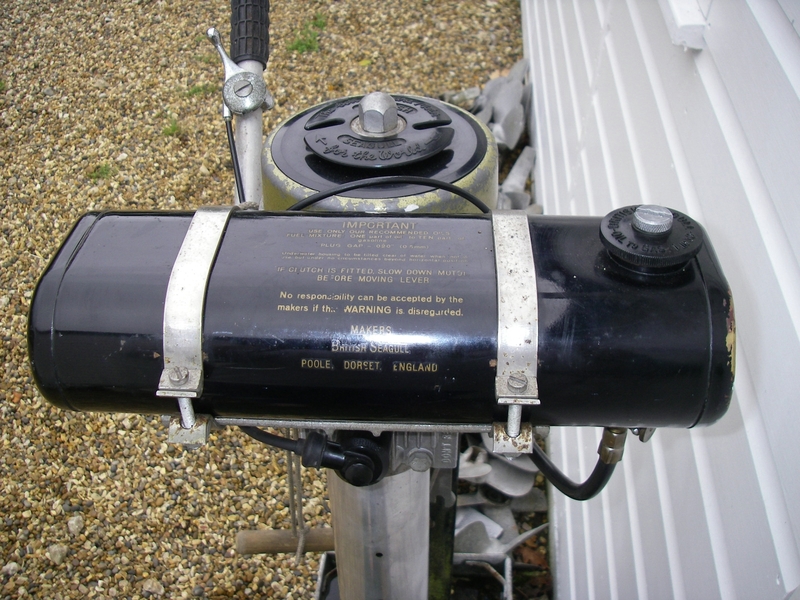 One off......new, long range brass tank on carrier. This new tank has only the slightest blemishes for 30 years of boxed storage. 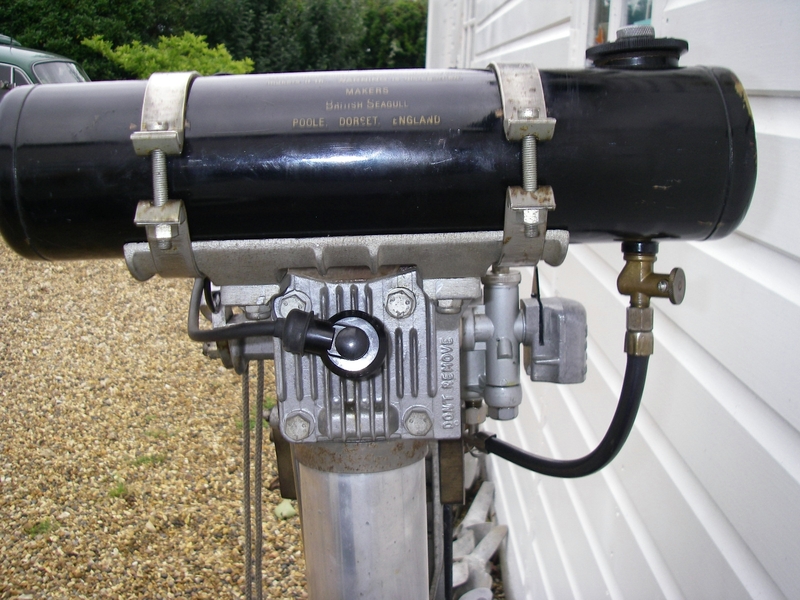 No dents, complete with original transfer and all mountings fittings and straps. £80.00 SOLD! Silver Century Plus For Sale. March 2006 SOLD! by April!! This 5 hp. engine has been totally stripped to last nuts and bolts. 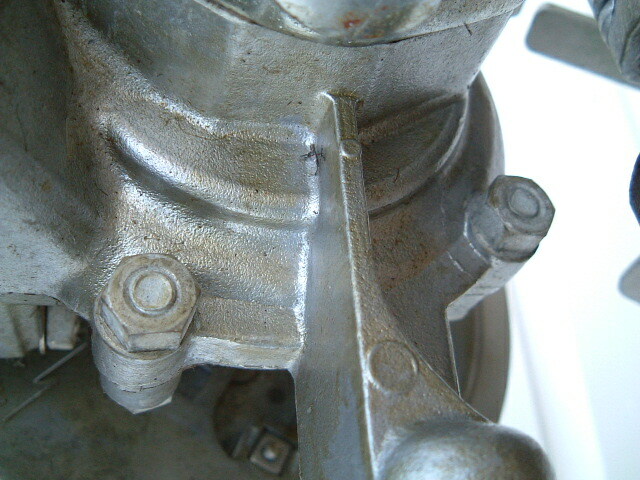 (because it had a crankcase leak!) Rebuilt, with many new parts. 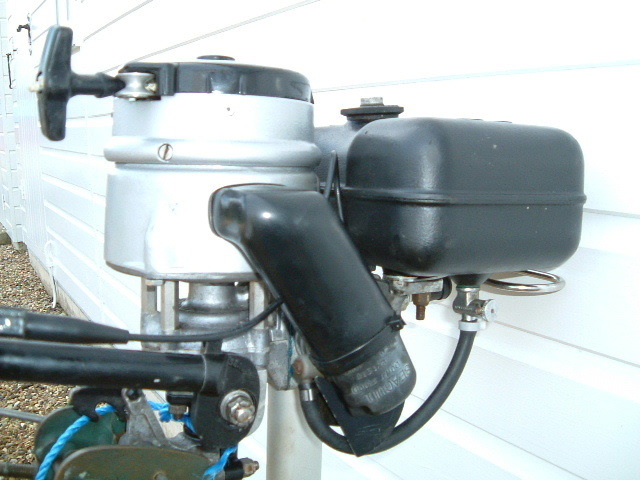 It is a 1972 model with a 1 gallon steel tank in good order.25:1 Conversion. Tank tested and with my normal 3 month warranty. Sold with spare drive spring and start cord. 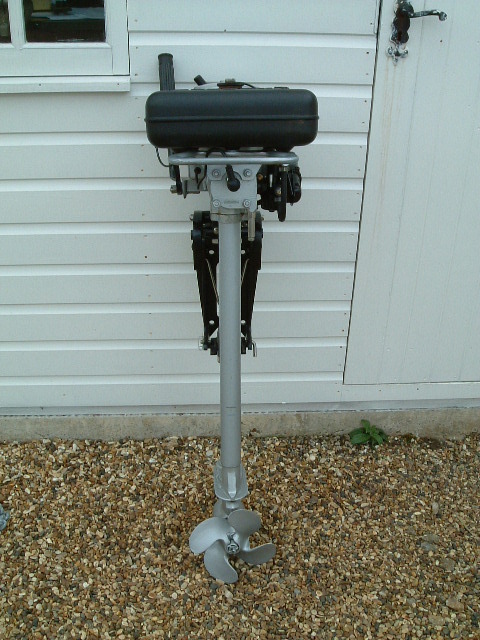 Motor to be collected from Essex. I do not recommend couriers, no matter how good they are, motors get damaged! 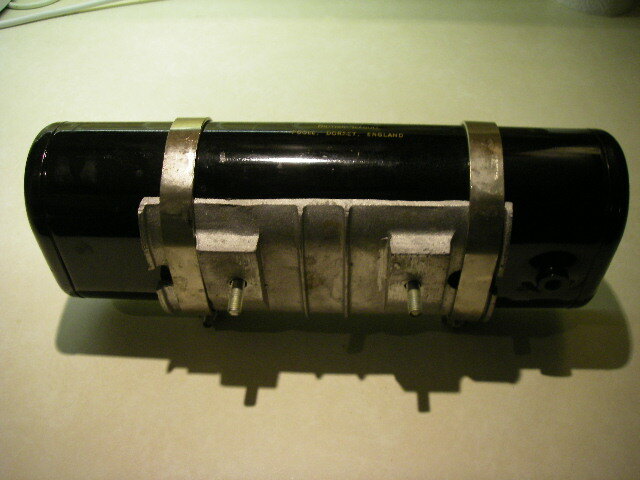 Unused, Forty Plus Longshaft. March 2006 SOLD! April!! This 3 hp. 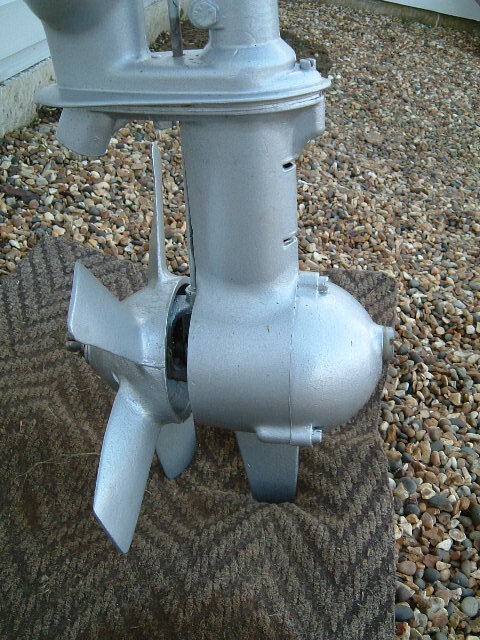 motor came to me as never having been used, but stored for many years, checking it over I do not believe it has ever been run since it left the factory in 1977.It is virtually unmarked. 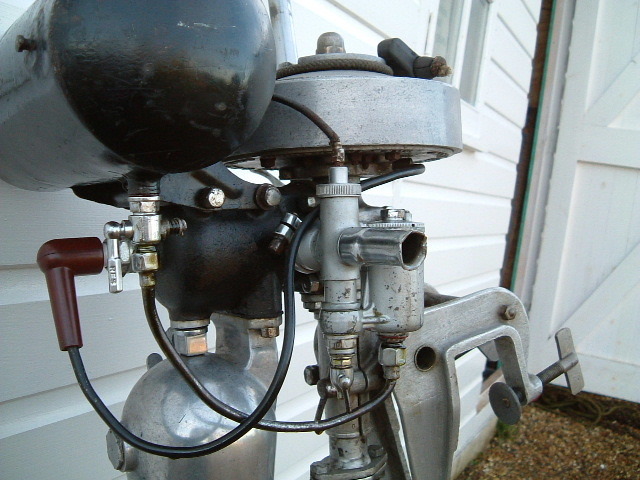 It is complete with the original 8 Com plug, old style HT cap and lead, (which I can change for you if you are going to use this motor.) 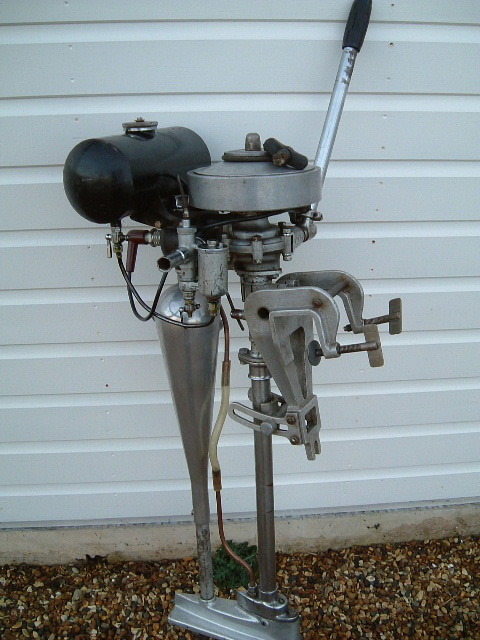 It has a Bing carb, so will run at 25:1 mix. I have not even put fuel in it. 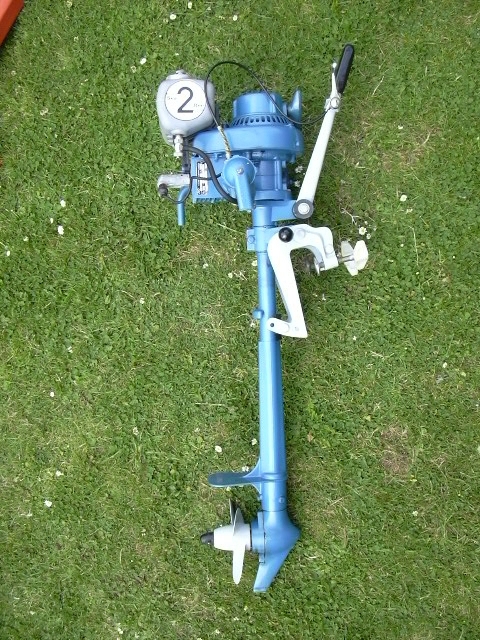 It does have a healthy blue spark and plenty of compression though, so will run. 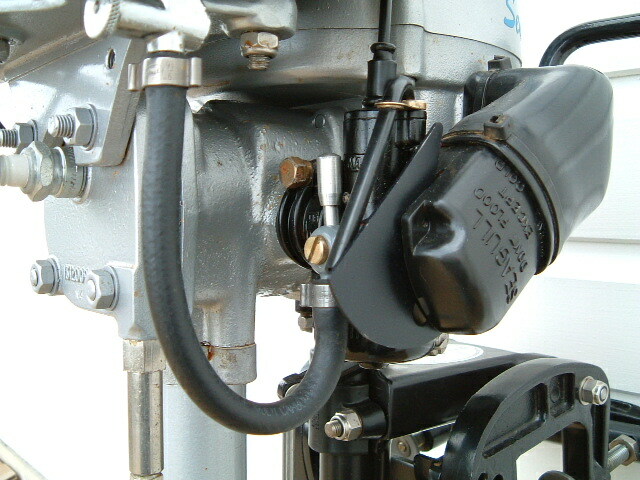 With start cord and spare spring. 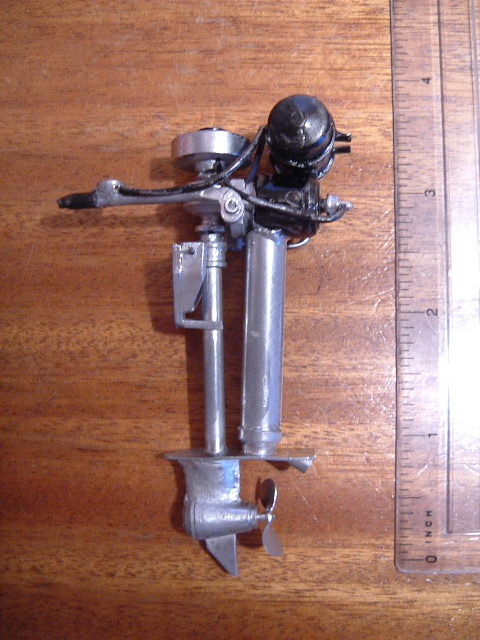 Silver Century Plus Longshaft, clutch drive. Clevedon, North Somerset. BS21 6ES.You can phone Mike Mayhew on 01275 546772. waverley.models at virgin.net Price about £15 plus post. 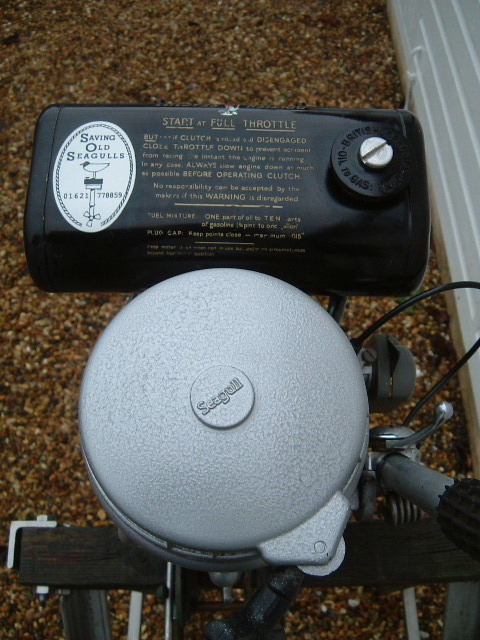 This is a model 102, I understand Mike is working on a Silver Century too! Cute aren't they! Just need a scale model dinghy to mount it on! John. If I am not answering the phone, this might give you a clue to where I might be! Please look through the 'FAQ' page first, you might find what you need there. PayPal payments now accepted! I send out a PayPal invoice link and using this you can pay with any credit or debit card securely on line. (Or a PayPal account!). This means you can pay using major credit cards, and from overseas as well. I will send your parts by first class mail, or if over weight, by Parcel Force. My P&P prices are some of the cheapest you will find. You will have to forgive me if you do not get your parts back inside 24 hours, I only get one post a day here, and that is often too late for me to catch the post out locally!